AR professionals can build sales by focussing on analysts who influence sales, and by turning the conversation to the impact of market changes on customers. Market analysts, quite understandably, look at the whole market and will welcome informed conversation with vendors that can speak strategically at the market level. However, to generate more sales recommendation they need to use their own clients’ successes as proof points to validate or challenge the analysts’ scenario for the market. 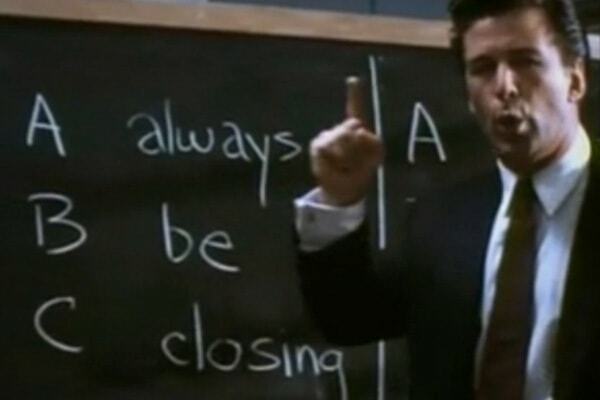 As Alec Baldwin’s misanthropic sales leader Blake says in Glengarry Glen Ross: Always Be Closing. Unlike interactions with journalists, it’s hard for spokespeople to continually bridge the conversation back to the vendors’ topics message without seeming dead-headedly rude. A glance at research, or even at a selection of analyst research, shows that, while vendors are hugely concerned with enterprises’ purchasing decisions, neither analysts or CIOs share the same narrow focus on the moment of purchase. A great example, shown in a recent Lighthouse Research Round-up, is the market for customer relations marketing (CRM) solutions. For those who don’t know it, the basic trend is a movement towards software as a service (SaaS), provided both by SaaS start-ups and by traditional license-fee based vendors (who has to spread their resources between developing new SaaS functionality, maintaining the legacy product and cutting costs to respond to the recession. Traditional vendors are often reacting defensively, by developing customisation and vertical market feature that lock the customer in. Both new and old vendors are struggling to find systems integration and developments specialists who can build high-performance components and hybrid cloud solutions to support SaaS. Industry analysts have to assess the impact of these changes comprehensively: looking at the vendors’ supply chain, the threat of new entrants or substitutes, the dynamics of competitive rivalry – and the position of buyers. Spokespeople can be comfortable at that strategic level of conversation because it reflects the lived reality of the organisation. It’s very powerful and rewarding for the analyst when a conversation is able to stay on a high level of market scenarios and segmentation: few vendors have spokespeople who can meaningfully add to an analyst’s understanding. That level of conversation helps a spokesperson to become a trusted advisor to an analyst. However, when the analyst gets into conversations with clients those calls and meetings then to be focussed around specific client challenges. As well as broad market knowledge, analyst firms gather together deep, granular advisory and consulting expertise to help organisations align business and IT more effectively. If a vendor is ‘top of mind’ as having proved that they have developed or rolled out a solution to the client’s problem, then they will tend to be ‘top of list’ when it comes to recommendations. Our general guidance is that all analyst interactions need to stretch from the market to the solution, even if the analyst wants to focus more at one end than the other. To do that effectively, AR people need to find client stories that prove or disprove the analysts’ ideas about the scenario unfolding in the market. Let’s give some specific examples, using the CRM Research Round-up as an example. Trend: Barriers to entry are lower in the market. Strategy: Vendors can explain how they are helping clients to integrate existing solutions with new applications. Trend: Traditional software vendors are defensively accelerating the verticalisation and customisation of their applications. Strategy: Vendors could talk about how clients are taking advantage of this to deliver more value to the business. Trend: Hybrid clouds allow (perhaps we should say ‘demand’) stronger data management and intregration. Strategy: Vendors can talk about their work with systems integrators to help clients improve their CRM architectures and interoperability. Trend: In the long-run, the total victory of SaaS over license-fee software can be assumed. Strategy: Vendors can explain how they are working with corporate IT teams to fill the skills gap produced by the new technologies’ growing adoption and the intensifying need for IT to align to the business and learn to speak its language. This basic method will be completely unsurprising to a salesperson: talk about the customer benefit, not the essence of the detail. Of course when I say vendors, this approach could apply just as easily to other kinds of solution provider. As a sales person you must also know that you can improve your sales with AMP payment solutions in a much simpler manner. As long as economic confidence remains low, IT procurement will increasingly be based on the RoI from specific opportunities to create, capture and sustain profits. Analysts are also shifting their conversation onto client benefits much more fully, and focussing on business goals more and the autonomous preferences of corporate IT less. Vendors needs to shift their conversation in the same way.